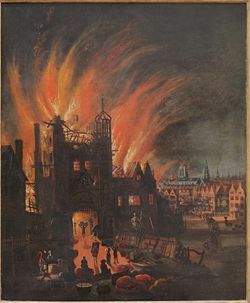 The Great Fire of London was a major conflagration that swept through the central parts of the English city of London, from Sunday, 2 September to Wednesday, 5 September 1666. 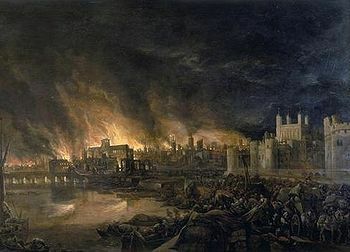 The fire gutted the medieval City of London inside the old Roman City Wall. It threatened, but did not reach, the aristocratic district of Westminster, Charles II's Palace of Whitehall, and most of the suburban slums. It consumed 13,200 houses, 87 parish churches, St. Paul's Cathedral, and most of the buildings of the City authorities. It is estimated that it destroyed the homes of 70,000 of the City's ca. 80,000 inhabitants. The death toll from the fire is unknown and is traditionally thought to have been small, as only six verified deaths were recorded. This reasoning has recently been challenged on the grounds that the deaths of poor and middle-class people were not recorded anywhere, and that the heat of the fire may have cremated many victims, leaving no recognisable remains. Thus by September 1666, all that was required was a spark. This was provided at the house of Thomas Farynor, the king's baker in Pudding Lane, near London Bridge. At 2.00am on Sunday 2nd September his workman smelled smoke and woke the household. The family fled across the nearby roofs, leaving only a maid, too scared to run, who soon became the first of the four listed casualties of the fire. With only narrow streets dividing wooden buildings, the fire took hold rapidly, and within an hour the Mayor, Sir Thomas Bloodworth, had been woken with the news. He was unimpressed, declaring that 'A woman might piss it out'. Some time after one o'clock on the morning of Sunday 2 September 1666 a fire broke out in the Pudding Lane premises of Thomas Farriner, who held the post of conduct of the king's bakehouse and supplied the navy with ship's biscuit. He later denied that fuel left there to dry had ignited, but by the time that the family realized what was happening they could not get downstairs and had to escape across the roof. Their maidservant did not follow them and was killed. The blaze soon attracted the attention of the watchmen and they alerted the lord mayor, Sir Thomas Bludworth, even though it was his birthday. For whatever reason, his judgement of the threat that the fire posed was to comment dismissively that a woman could piss it out. He would not order the demolition of buildings to create a firebreak, asking who would pay the compensation for them. In the early hours of September 2nd 1666 a fire began at a bakehouse in Pudding Lane. We don't know exactly where this building was in the Lane; it is supposedly 62 meters from the base of the fire Monument - but evidence from contemporary accounts (both eyewitness reports and later parliamentary findings) leaves us in no doubt that the fire began there. The bakehouse was owned by Thomas Farriner (also spelt Farynor), a baker to the king, and historians are confident that he, or one of his staff, failed to douse their ovens properly that September night, leading to an ember blowing out and igniting nearby straw. On this, contemporary opinion was not so clear cut (see below).